After introducing the basics of a Google AdWords campaign set up, this post will go into detail about what should always been done before starting a paid Facebook campaign in particular for those whose final objective is not exposure but leads, purchases and new customers. Many people assume that boosting a post is enough to get the results we want to achieve from a paid social media campaign. It’s not! After this post you’ll consider the “boost this post” option as your last option for customized campaigns. The pixel code installation in every page of your website is essential to track actions (Facebook calls them “events”) of your visitors that are important to you. Good examples of events can be purchases, form completions, page visits and so on. If you are tracking purchases, Facebook gives you the option to add the conversion value and the currency to measure additional insights. With Facebook pixel you can target specific audiences like people who visited a specific page of your website and create look-alike audiences of people who are similar to your customers. You can also automatically set the bidding of ad sets in order to reach people who are more inclined to take a desired action (like purchase for example). To take advantage of this setting choose “conversions” as an ad delivery option in the optimization and delivery tab of your ad set. The campaigns results are absolutely more clear and measurable as your conversions and sales appear on the main tracking panel. After the installation If you want to doublecheck that your pixel is working correctly you can download this free chrome extension: Facebook Pixel Helper. If you really want to know who your customers are and more in general about the audience that is engaging with your content, there’s not a better place to start than in “page insights” to get find more details. This is not only a great tool which helps you understand how your content is performing. In the “people” section of page insights you will find more specific data related to your page audience such as gender, age, language and location. You can use these details when you define the audience to target them correctly in the ad sets of your campaigns. Building well targeted audiences is key to succeed with Facebook advertising and the first step is to know precisely who are the people who like/follow your page. When it comes to digital advertising strategies there’s nothing to invent. It is quite easy to analyse and tweak what others are doing to make it your own. Visit your competitor’s website and Facebook page to see if and how they target you with re-marketing adverts. If they have the pixel installed in their website you should be able to see their ads in your feed over the next month. When you see their ads, click on the options button for the ad and select “why am I seeing this”. This useful hack will give you insight into how they have set up their audiences. If you don’t have time to wait for that you can try the hootsuite tool. You can search ads by advertiser name, text, URL and broad categories. It’s a useful tool to use as you not only see the ad design but also the reactions and comments to it. Moat.com is another great website you can use to research the GDN campaigns of your competitors. You can activate an email alert and be informed when your competitor has launched a new ad. If you are still lacking ideas, Facebook itself with the creative hub offers a great showcase of the most successful and popular campaigns’ creatives. Most importantly when you run a campaign you have the opportunity to launch A/B testing experiments for the ads at the ad set level. So if you have some different creatives in mind but unsure which one to use, this function will help you test both. 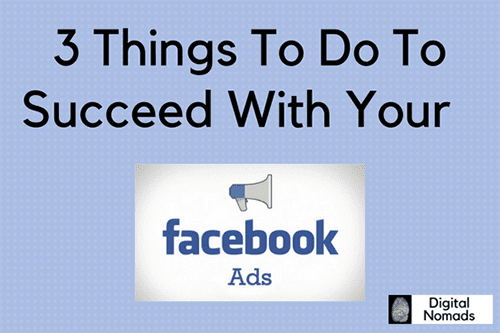 Now you are ready to set-up your first conversions campaign in Facebook. Don’t forget that testing plays an important part in determining the success of your strategy. In particular you must test your audiences and your creatives to get the most out of your advertising spend. If you are still unsure or want more advices about targeting your future customers with Facebook ads, then let’s have a chat!